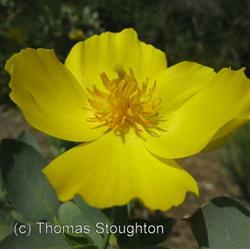 Bush Island Poppy is a beautiful shrub with waxy, blue-green leaves and large(3”) golden flowers that bloom intermittently all year, with particularly strong blooming in spring and summer. The combination of its leaf color, gorgeous blooms and drought tolerance make this a highly-prized landscaping plant. It can be used as a small tree or accent plant in a small garden, as a backdrop in large-scale dry borders, or as a hedge or screen that requires very little water. This plant is not a host to the Glassy Wing Sharpshooter and has been recommended as a replacement for Oleanders that have died as a result of Pierce’s Disease. Provide full sun or part shade and well-draining soil.